For some people having an outhouse was a staple of life. This old time version of a restroom still holds some nostalgia for some. There is a nostalgic “cool factor” of having an outhouse in their backyard. I guess there still could be some practical uses for an outhouse. It’s quite a challenging project, but if you are up for the task then it could be rewarding to see it come into fruition. 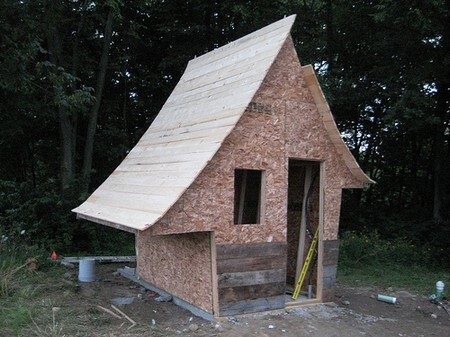 Here is how you can build an outhouse. Continue reading to find out how. Choose the location of the place you’d like to build your outhouse. Location is this case is one of the most important aspects of building and completing this outhouse project. The selection should be in a place that is not in traffic generally or in common foot areas and away from any water sources like creeks, rivers or brooks. You don’t want your outhouse to be the cause of contamination. Position your outhouse appropriately. Dig a pit to serve for the base of your outhouse. As a general rule of thumb, this usually is approximately three feet by three feet and about five feet deep. Make sure the pit is deep enough to endurefor a good length of time. Build the floor of your outhouse. Do this with wood or either by using concrete. Leave a hole in the center of the floor for the waste to go through. The sides of the outhouse should fit the same shape and size of the pit you dug into the ground in the previous step. Build a cover for your outhouse. This can vary depending on your personal tastes, likes and dislikes. You may add a riser by making a square box out of wood. Place another hole in the riser if you decide to install one. This will give people a place to sit and it will also help contain the order of the outhouse. Make a covering for the pit hole with paint and siding. Roll roofing or corrugated roofing needs to installed to prevent the rain and other elements from ruining the structure.Not to mention as many critters and animals as is possible. Add a source of ventilation if you so desire. This depends entirely on the kind of outhouse you want to keep. You can add the traditional crescent moon shaped carving into the entrance of the outhouse. This may be enough to satisfy your decorative wants. You can also place screen panels over the top of the outhouse for added ventilation. This couldn’t hurt just in case it is needed.